CHICAGO--(BUSINESS WIRE)-- Hyatt House Mexico City/Santa Fe opens today, marking the first opening of a Hyatt House hotel in Mexico and Latin America. With the new property, the Hyatt House brand enters the Latin American market with an innovative hospitality offering that beyond welcoming guests, looks to welcome neighbors. Grupo Presidente, a leading Mexican hospitality company, will be responsible for hotel operations. With social areas to enjoy, rest and feel at home, Hyatt House Mexico City/Santa Fe offers 119 residentially inspired guestrooms designed to accommodate the travel needs of those visiting Mexico City’s Santa Fe area. Located less than 17 miles from Mexico International Airport, the hotel is connected by a bridge to Centro Médico ABC Hospital and a short distance from corporate offices, shopping centers and restaurants. For more information, please visit Hyatt House Mexico City/Santa Fe. Hyatt House, a brand of Hyatt Hotels Corporation, was created in 2012 and offers more than 70 locations throughout the United States, China and Puerto Rico and was inspired by extensive research into guest experiences. 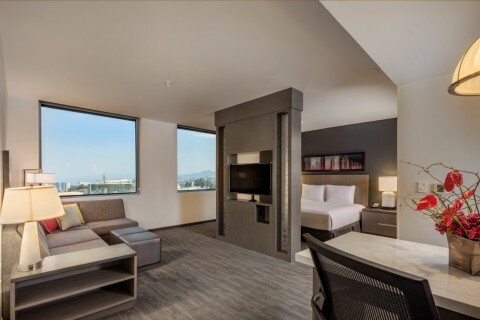 Hyatt House hotels offer services, amenities, upscale spaces and a casual, comfortable environment that reminds guests of home. For more information, please visit hyatthouse.com, join the conversation on Facebook or tag photos using #HyattHouse and #WhySettle (in English) and #PorQueConformarse (in Spanish). Grupo Presidente is a leading Mexican hospitality company specializing in hotel, restaurant, and more recently, senior living residences operations and management services. Having consolidated as a multi-brand operator, Grupo Presidente is expanding their capabilities in hotel development as third-party managers and in different segments, such as Hyatt House Santa Fe, the first extended stay hotel of the Hyatt brand in Latin America. The group plans to become the leading hotel management company in Mexico, representing the largest hotel brands in the world, and offering excellent lodging options for the domestic and international travel markets. For more information, please visit: www.grupopresidente.com.mx. Follow Grupo Presidente on Twitter and Facebook.